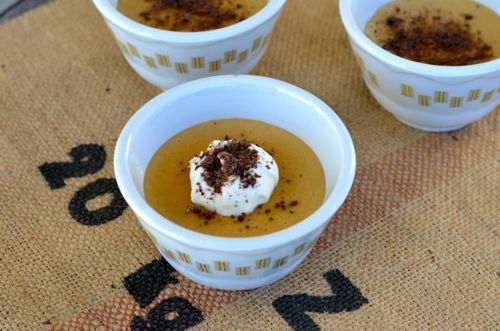 Pudding is one of the ultimate comfort foods and if you are really in need of some extra comfort think about making this extra creamy bourbon butterscotch pudding. It’s a great twist on a classic dessert – consider each spoon as a little hug! Enjoy! !From by the bay wishing you comforting food memories! Melt butter in a medium saucepan over medium heat. Scrape in seeds from vanilla bean; add bean. Cook, swirling pan occasionally, until butter begins to brown and smell nutty, about 3 minutes. Add brown sugar and cook, stirring occasionally, until sugar is starting to dissolve, about 2 minutes. Add cream, milk, bourbon, and salt; bring to a simmer. Remove from heat. Whisk egg yolks, cornstarch, and sugar in a large bowl until smooth. Gradually add hot cream mixture, whisking constantly. Wipe out saucepan. Strain custard through a fine-mesh sieve back into saucepan and cook over medium heat, stirring often, until custard bubbles occasionally and starts to thicken, 5–6 minutes. Transfer mixture to a blender. Blend briefly on low speed until smooth. Place ramekins or bowls on a rimmed baking sheet. Divide custard evenly among ramekins and chill until set, at least 3 hours. Top with creme fraiche and crushed cookies to serve. This entry was posted in desserts, pudding and tagged Bon Appetit, Bourbon recipes, butterscotch recipes, easy recipes, egg recipes, pudding recipes on April 24, 2014 by entertainingbythebay. From by the bay wishing all a Happy Holiday! This entry was posted in Uncategorized on April 20, 2014 by entertainingbythebay. 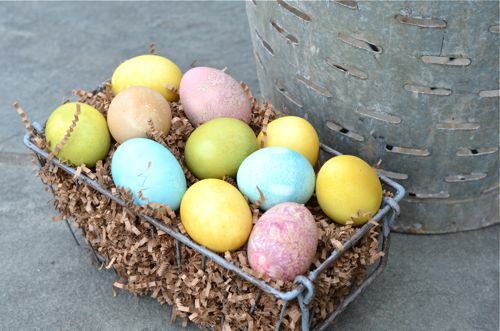 It’s worthy exploring again the use of foods from your refrigerator and spice cabinet to make these natural dye colored Easter Eggs. 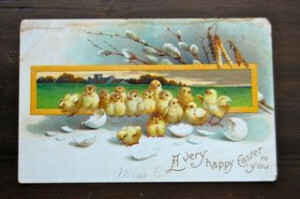 From by the bay wishing you a Happy Holiday filled with cherished food memories! Place eggs in the bottom of a large pot add water to just cover the eggs along with a little sea salt and place on medium heat. Bring water to a boil. Remove from heat and cover with a lid for 13 minutes. Use a timer to make sure you are not over cooking your eggs. Once the eggs are done, run them under cold water to cool to stop them from cooking. The result will be a perfectly cooked hard boiled egg. To start I suggest using glass jam jars with covers or 16 ounce plastic deli containers with lids. Add the cooled hard boiled eggs to the natural dyes. 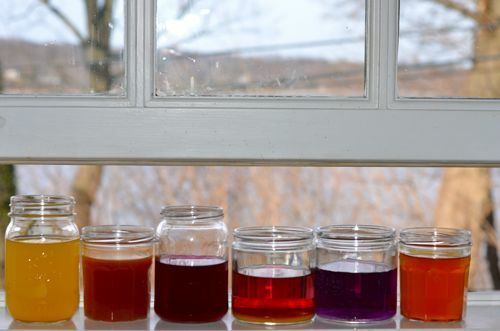 Make sure eggs are completely submerged in the dye, add a little water if the eggs are not covered. Place a lid on your container and place into the refrigerator overnight for intense colors. 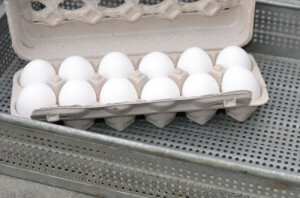 If you want softer color you can let eggs sit in dye for just a few hours in the refrigerator. Add hard boiled eggs to the dye once cooled unless recipe says otherwise. When making the dyes, I suggest using plastic gloves so not to stain your fingers. This entry was posted in appetizer, fun Foods, recipes and tagged annatto seeds, Easter recipes, Greek Easter recipes, natural easter egg dyes, paprika, perfect boiled egg recipe, red beets, red cabbage, turmeric on April 17, 2014 by entertainingbythebay. This recipe is adapted from a meal I shared at a friend’s home outside of Florence many years ago. It started my love for the herb rosemary. I had never had meat braised in milk before and as an inexperienced american it seemed odd to me, but it was so delicious. The milk creates a lovely gravy after braising. Over the years I have evolved the recipe by adding onions for another dimension of flavor and by trying goat milk . Although this dish works great with cow’s milk, I find the results with goat milk to be slightly sweeter and makes for a creamier gravy. This is probably a matter of personal preference. Either way this is recipe that is simple to make and big on taste. Preheat oven to 350F. In dutch oven heat butter and oil on stove until hot, add the pork loin and brown on all sides. Remove from pan and place to side. In same pot please add the onions and sauté until soft, add back the pork, add rosemary and milk. Cover and place into the oven for two hours, stirring occasionally. Let pork rest slice and serve with onion and milk gravy. Garnish with gremolata. In a bowl add parsley and minced garlic. Into this bowl finely zest the lemon. Add salt and mix. Refrigerate until ready to use. This can be used to compliment veal, pork or fish. This entry was posted in main dish, pork and tagged braise recipes, easy recipes, Florence Italy, goat milk recipes, italian food, italian recipes, pork recipes, rosemary recipes on April 1, 2014 by entertainingbythebay.